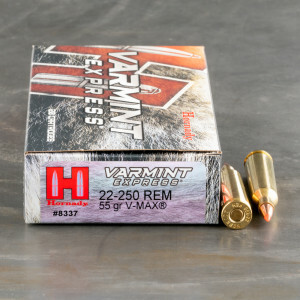 22 - 250 Remington is a small bore, but extremely fast and versatile round. The round can be used for a variety of purposes, including varmint, predator hunting, and even deer hunting. Though some states may ban the 22 - 250 due to it’s relatively small 22-caliber projectile. The very best I have ever used, 2 one shot kills, one at 175 yards dropped in his tracks, the other at 150 went 10 yards and dropped. I will be buying more, and have told many friends, who will be trying it. Great Job Federal Ammo. EXCELLENT AMMO. My father gave me his 1976 Sako 22-250 2 years ago. I shot it several times w some of his older boxed ammo, and could only get 1.5-2" groups. I was not impressed so I did not use it much.. I read that the twist rate was 1 in 14", so decided to try these loads with lighter/shorter bullets. I WAS AMAZED -- 1/4" and 3/8" groups! Could not have expected better! Shot from bench on sand bags, but in the wind in open area and not using my best technique. WILL DEFINITELY ORDER MORE. My chronograph was not working, but can assume great velocity uniformity by group size. Bob said: "A great way to pick up ammo without having to search for a retail outlet." 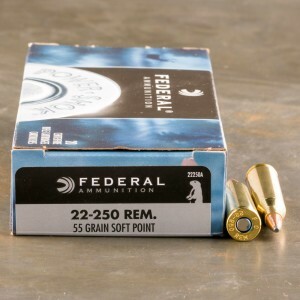 Is the .22-250 Remington a Rimfire Cartridge? No. 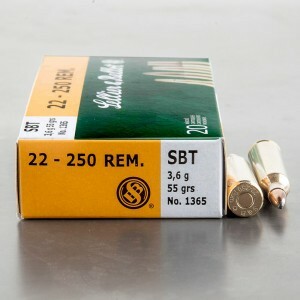 Unlike a few smaller rifle cartridges, such as the .22 Long Rifle and .17 HMR, the .22-250 Remington is not a rimfire cartridge. This is a centerfire round, which allows for easier case reloading and is the popular choice for medium to large-caliber cartridges. How Was the .22-250 Remington Named? Like the cartridge itself, the name comes from the .250-3000 Savage, a cartridge that had roughly a .250-inch diameter, could reach 3,000 feet per second, and was developed by Savage Arms. 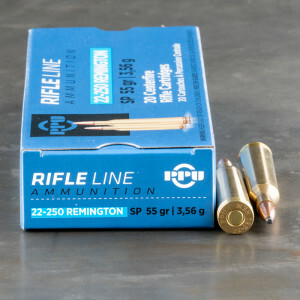 The .22-250 Remington has a bullet diameter of roughly .22 inches but uses a necked down case from the .250-3000 Savage. In honor of its predecessor, Remington manufacturers kept “250” in the name. 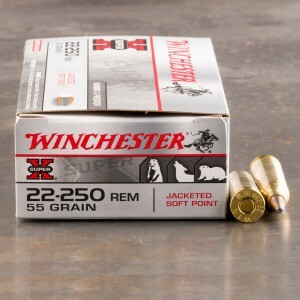 How Fast is the .22-250 Remington? Fast! The typical .22-250 Remington cartridge has a muzzle velocity over 3,500 feet per second, and you can find products that are rated above 4,000 feet per second. 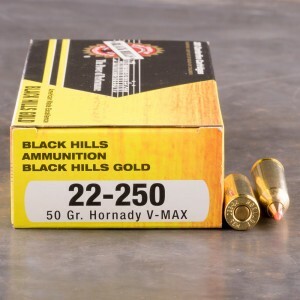 For example, Hornady’s 40-grain V-Max has a listed muzzle velocity of 4,150 feet per second. 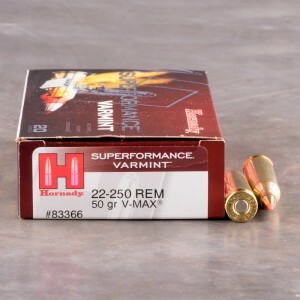 Even larger bullets display a high level of speed; the 55-grain Varmint Express has a muzzle velocity of 3,680 feet per second, which is certainly an impressive number. 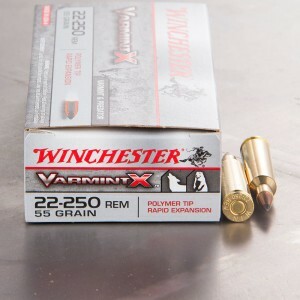 How Does the .22-250 Remington Compare to the .223 Remington? These are very similar bullets, although they are not interchangeable whatsoever. 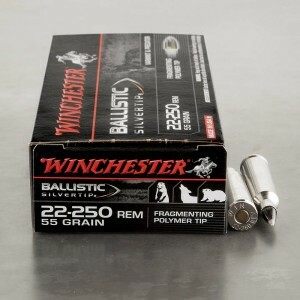 Generally, you will find that the .22-250 Remington has lighter bullets but faster energy and faster trajectories. As we said earlier, the .22-250 can reach speeds faster than 4,000 feet per second, while .223 Remington ammunition tends to top out at about 3,750 feet per second. 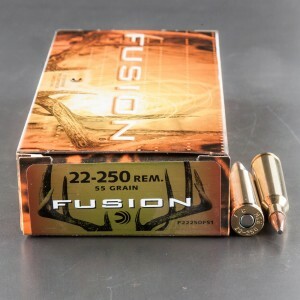 The .22-250 has listed muzzle energy of 1,500 foot-pounds, while the .223 Remington only reaches about 1,300 to 1,400 foot-pounds for most products found on store shelves. How Does the .22-250 Remington Compare to the .22 Long Rifle? It’s really not much of a comparison. 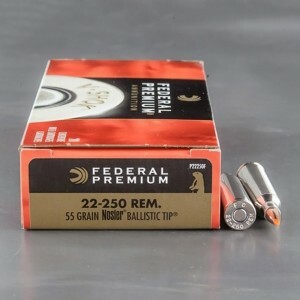 Despite these both being “.22” cartridges, the .22-250 Remington is far more powerful and delivers greater speeds. 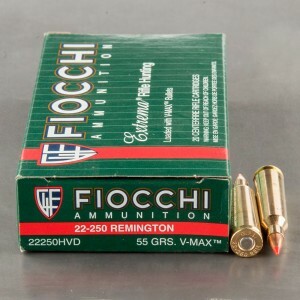 .22 Long Rifle ammo is a rimfire round and rarely reaches 1,700 feet per second, while the .22-250 can go over 4,000. The .22 Long Rifle, which has bullet that weigh about 30 to 40 grains, can just barely get above 200 foot pounds of muzzle energy, while the 22-250 can easily reach 1,500 foot pounds or more. 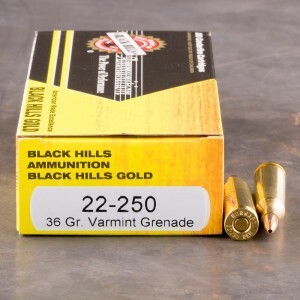 The advantage of the .22 Long Rifle, however, is price; it’s one of the most affordable rounds on the market. 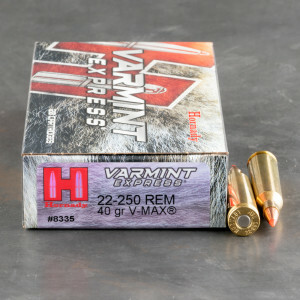 But when it comes to accuracy, speed, and energy, it doesn’t come close to the .22-250 Remington.